As a professional motorcycle riding coach I work with all types and styles of riders. There are those that are scared of the streets, those that aren’t quite sure if they should be riding a motorcycle at all and those that have more ego than ability. This article is about the latter and it is very serious to me. I recently acquired a client that is just learning to ride and so is her husband. He passed the MSF course and she didn’t. He bought himself a high powered Sportbike and off he went thinking he knew everything about riding a motorcycle. “coming into a corner too fast…just lean it over more”. That is what he said to his wife who has never been out of first gear. I took them to dealership to buy her a motorcycle. We found what I believed to a good choice for her but the husband wanted her to have something more like his. A motorcycle way out of her ability. So this what I have to work with. After a few sessions of private training in a parking lot (which I had to ride her bike to…) she started to develop some OK skills. Was she street ready, no. On a day we had scheduled for a coaching session she told me that her husband and son (both beginner riders) told her she didn’t need any more help, she was ready to go, so off she went. Her son rode her motorcycle home from their shop where she kept the bike (and crashed in their parking lot) and then her husband took her out to ride around the neighborhood. I went out one time and rode with them. Honestly I had never been more scared for a rider than that day. But there was nothing I could do. I don’t want to get in between a husband with more ego than ability and his wife. Telling someone who has never been out of second gear that they are ready to get on the highway when you shouldn’t be yourself…??? I have video of the two of them and to be honest , she actually rides better than he does. I just needed to get this off my chest because I care. This entry was posted in bonneville salt flats, cafe racers, choppers, cruisers, flat track, Helmet Time, motorcycle camping, motorcycle clubs, motorcycle racing, motorcycle training, scooters, sportbikes, superbikes and tagged motorcycle training, motorcycle travel on February 19, 2017 by themotoworld. There is a saying, If you want to be happy for a day…drink. If you want to happy for a year… get married. If you want to be happy for life…ride a motorcycle. When I started traveling on a motorcycle I found a peace that even the Hippies of the Sixties didn’t know about. It was the connection between man and machine and all that Mother Nature can throw at you then at the end of the day you set up camp (or crash at a cheap motel) and reflect on your day and a big smile shows up on your face. The reason this blog is called Helmet Time is because inside your helmet you have times of heavy concentration and others that you are just enjoying where you are at. The feel of the weather, the ability to look all around, take in the beauty with no impediments. The feeling of your motorcycle whether it be an ultra smooth multi cylinder Tourer or a vibrating thumping Tourer, you settle into a state of pure bliss. I’m on my motorcycle. Very few cars offer a true connection… with air conditioning, power widows to seal everything out and a stereo system that shakes the road and power steering, most cars isolate you from the world. But on a motorcycle you feel the world. On a motorcycle you need to be aware of everything, and that is part of the enjoyment of riding. You’re engaged, you’re focused and that is a form of meditation. Body and mind come together along with your machine, you have a flow. Settle into it and enjoy every moment…well unless you happen to have to commute on the 405 Freeway in Southern California then you know you did something bad in a past life and you’re having to repent. 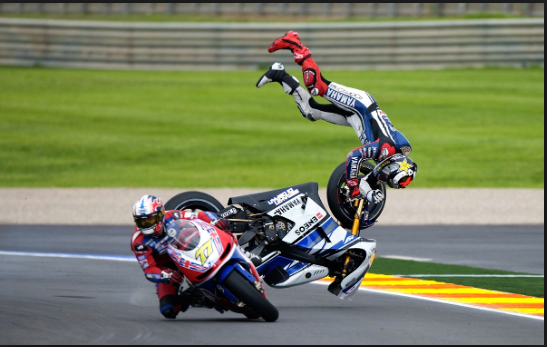 Oh, and when you’re meditating on your motorcycle, try not to be this relaxed!!! This entry was posted in bonneville salt flats, cafe racers, choppers, cruisers, flat track, Helmet Time, motorcycle camping, motorcycle clubs, motorcycle racing, motorcycle training, scooters, sportbikes, superbikes and tagged motorcycle travel on February 10, 2017 by themotoworld. Well, 2016 has been quite a year…no kidding! we’ve lost so many great entertainers (I don’t care about politicians that have left this world), but some really cool people…Prince, Princess Leia, Zaza Gabor, Mrs. Brady, Arnold Palmer (I’m a lousy golfer and wish I could have taken lessons from him!! ), Muhammed Ali, Merle Haggard, Abe Vigoda , David Bowie, even Grizzly Adams has passed away. So instead of being melancholy about these and many others that have entertained us over the years that passed away this year I decided to have a few friends over to celebrate their lives. Let’s have a party, I’ll provide the beer. Here’s to a much merrier 2017 and a lot of good riding…and if Santa brought you a new motorcycle you must have nice and not naughty…. This entry was posted in bonneville salt flats, cafe racers, choppers, cruisers, flat track, Helmet Time, motorcycle camping, motorcycle clubs, motorcycle racing, motorcycle training, scooters, sportbikes, superbikes and tagged motorcycle travel on December 31, 2016 by themotoworld.